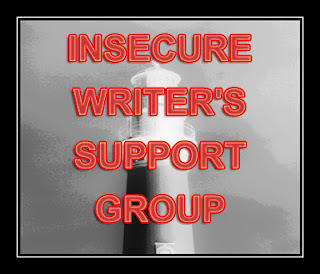 Welcome to another monthly installment of the Insecure Writers' Support Group, hosted by the mercurial Alex J. Cavanaugh. Mercurial. That's a good word, isn't it? But what does it actually mean? According to dictionary.com the first meaning is "changeable, volatile, fickle" etc. Well that doesn't sound like Alex. He's one of the most dependable people I know. The second sense is "animated, lively, sprightly, quick-witted". That's more like it. So that's what I'm feeling insecure about this month - inappropriate word choices. Not necessarily using a word with the wrong meaning, but a word that doesn't seem to fit in the story. Let me explain. I've had more than one CP suggest that I use rather "big" words that are jarring and interrupt the pace of the story. They even told me they had to go to the dictionary on a couple of occasions, which really threw them out of the story. Now, part of me likes the idea of being an educator and introducing people to new words, but not if it's to the detriment of smooth narration. And the story has to come first above everything. A bit of backstory. I've always had an affinity for words, from an early age, and was obsessed with knowing as many as possible. Although my writing might have many other flaws, spelling was never an issue for me. I felt that words were precious things and deserved the care and respect of being spelt properly. At primary school, classmates would come to me rather than the teacher to check how to spell something. I've shaken my head in despair at enough official school newsletters and teachers' comments since then to know that teachers aren't all they're cracked up to be! By my teenage years, I had honed my passion for wordplay to a fine art. My favourite pastime was to hang out with my friends talking the most convoluted rubbish possible. For hours. We would try to out-rubbish each other. (It's probably why none of us ever had a girlfriend). As an example, I preferred to say (and still do) "How do I gain access to this" rather than "How do I open this" if faced with some recalcitrant packaging. (That one actually comes from the wonderful novel The Queen & I by the late Sue Townsend, in which the monarchy get deposed from the palace, and the Queen has to open a tin of beans for the first time.) Vestiges of this behaviour linger to this day and probably annoy my family no end, but it's like a nervous tic. I do have a natural proclivity to rather flowery language, which I've worked hard to pare down in my writing. So, the point of this post? Not knowing where to draw the line. Using stronger, more distinctive words is advice that often comes up, but this can definitely be taken too far. Like most things, it's a matter of balance, and finding that balance is one of the great challenges of writing - one I think I'll be undertaking for a long time to come! How easy or difficult do you find it to pick just the right word? Go here to check out the other bloggers in the IWSG. I sometimes come to a grinding halt in a ms while I search my two theasuruses (thesauri?) AND the Word version too. I've sometimes spent days finding the right word. Other times, it's pretty easy. I don't use overly 'big' words, but it always has to be the 'right' one. PS I don't think there's anything wrong with using words that people have to look up. It's preferable to a book littered with the same word right the way through. I'd go with what feels right to the character more than anything else. Growing up in Dublin, me and the lads also did a lot of rubbish-talking, but our version was making the words as small as possible, with a good few f-bombs thrown in there for fun. I have a friend who works large words into the conversation, and while it leaves some people scratching their heads, he really doesn't force the words--they come off sounding very natural. As you say, it comes down to balance, and making it sound natural. And yes, I suspect we ALL struggle at times with finding just the right word for just the right time. Whatever you are comfortable with should be your rule of thumb. Stephen King advises that if you have to look up a word, drop it. I'm not in full agreement as I love to leaf through the thesaurus to determine if my word choice works on more than one level. But I don't use it to find a "bigger" word, only the most appropriate one. It's all about the character. NO ALCOHOL TO BE BOUGHT INTO THE COMPLEX. I noticed it immediately and made a comment to my husband, as we walked past two undercover detectives, who, of course realized we must not have been stoned to notice! lol! I have been known to lose hours diving into my shelf full of thesauri for the right word, then end up deleting the sentence. It's a struggle to balance the precision of a large lexicon with accessibility. My CP's are forever telling me that I use too many "50 cent" words. I don't want to lose readers because they don't understand what I am trying to say. Out-rubbish each other - that's funny! It takes practice to tone down those big words, but it can be done. I hear ya! I love playing with words and like to come up with interesting word concepts and juxtapositions. I keep a dictionary in front of me and I'm continually looking up words online to make sure I'm using them right. Often I'll look up the same words. Poor memory I guess. If your readers are constantly having to go to the dictionary, then I'd say that's a pattern you might want to look at. That being said, I'm all for finding the best word, the strongest word, the most powerful word possible - especially in flash fiction, where the word count is limited. When I was a teen, I took great pleasure in finding big word insults for annoying guys (you would never have been one of those...you know the meat headed variety who think a Mustang makes them king?). You could call them a troglodyte and move on satisfied. I don't mind having to look up a word or two when reading, it's how we increase our vocabulary after all, but too many pauses distracts from the story. Thank goodness for my trusty thesaurus, I consult that thing all the time, and yes, I often spend too much time searching for just the right word. My husband and I play Scrabble often. He is famous for a multitude of two, three, and four- letter words. My words are always much longer. Our daughters and my husband originally assumed I'd always win. But it's amazing what he could do with those tiny words. He remains the champ. In my writing, if I have a word that's close to what I need, but I know it's not the one I want, I stick it in anyway and highlight it with yellow. Then after I finish writing what's in my head (before I forget) I come back to that yellow spot again and again, trading the word for a better one and continuing until finally I have just the right word. Or at least, what I think is the right word. I'm constantly looking up words in my Thesaurus. Often I have to look those words up in the dictionary to be sure I'm using them correctly. I've always joked there are no big words in my books because I don't know any. I, too, spend a lot of time looking up words in my dictionary and thesaurus to find just the right one. I don't mind looking up a word or three while I'm reading someone else's book, but more than that gets distracting. However, I don't like the idea of "dumbing down" the word choices, either. As you said, finding the balance is the key. Nick, I love stumping people with my big words, but only for the newspaper features that I write. For the books (MG) my editors ask me to keep the words simple that children can easily understand. Like others have said, I think it depends on the character. I come up with words all the time that I know are too sophisticated for my narrator. So sometimes I have to hit the thesaurus. I love finding new words in a book. I like to try and guess the meaning of it, then check to see if I'm right. I don't always stop reading and check straight away - if I'm enjoying the story I skip over it and check it later. I do that in final edits. I check out my word use and simplify some and complicate others. I want to be accessible to all readers, but I don't want to come across as simple in my pontification. haha. Recalcitrant, proclivity, oh I do love a good word. My favourite as of today is hornswoggle. As for mercurial, in Vedic astrology, mercury is the planet of communication and thus, of writers! Mercury is the minister to the king - the Sun - and advises the king using his qualities of adaptability, flexibility and discrimination. Mercury is all about the details and is curious, playful, dexterous and open minded. I just struggled with this a few moments ago in a blurb alone. My daughter didn't like one word choice and wants me to change it. She's 18 and more intuned to the right target audience, so I may consider it. Funny how our words choices are so important. I will admit that if I have to look up the meaning of a word, I tend to not enjoy the story too well. Annalisa - Roget's is a good thesaurus - you can find some really random stuff in there! Mark - Our crews could have had a rubbish-off! Jeff - Yeah, if it's dialogue, it has to be something the character would say. Gail - Well, I don't use big words for the sake of it - they just tend to up in there because I enjoy them! But it has to be about what the reader would enjoy too. Melissa - Yes. Need to listen to the character. Carolyn - Oh yeah, that really grinds my gears. I had the bought/brought thing figured by about age six! Elizabeth - I kind of think my word choices would be best suited to literary fiction, but I don't write that. It is hard to get it right! Alex - I'm getting there. I'm glad it got pointed out! Arlee - I know, sometimes I don't know if it's a word. I used the word "beringed" to describe a character who ostentatiously wore lots of rings, and one of my CPs attached a question mark. I'd seen it used once before in a book, but maybe that writer made it up! Madeline - That's right, and the best word might be something really simple. It's all about context and placing. Elizabeth - Ha! Troglodyte is a great one. Jean - I think we need to think about the flow of the book. Definitely don't want to trip people up all the time! Debi - That's a good tip. I only tend to do that with character names that I don't know yet, but it's a good idea to do it with words! Diane - I don't think your to-the-point style needs big words! Lori - Yep, it's all about balance. I tend to look up the word later, not during reading, because it'll usually stick in my head and bug me! Meradeth - I must talk in a much less convoluted way on here than I do in real life! Rachna - I can definitely see that for MG. I'm writing YA right now - and I think that's hard to get right in a lot of ways. You don't want it to be so simple it's patronising. Sarah - That's a good point. My big words don't tend to come in dialogue, but even with 3rd person it's always someone's thoughts. Chris - It's definitely fun! That's why I enjoyed my A-Z challenge last year, where I had to work in five random words into a sentence for each letter. I learnt a ton of words! Laura - I'm the same. Sometimes my guesses are way off! Sydney - Yeah, it needs to be interesting, but not too distracting. Hard! HJ - Thanks for that. Always good to learn more! Miranda - It won't spoil a whole story for me, but too many big words does become clumsy. I think it's totally legitimate to make up a word if it makes sense and the meaning is inherently obvious in the context that it is used. I've made up a few words in such a manner and nobody seemed to notice a difference since it made sense. After all, words come from somewhere--why can't it be you. I love reading new words that I have to figure out what they mean or look them up. Then I try to use them. My early writing is filled with flowery phrases and big words. Hilarious to go back and read, not so cool to actually show anyone. Nick, I agonize over this! I, too, have been accused of "letting the big words come right out." And I so admire a writer like Robert Louis Stevenson, who always seemed to use the exact right word! Hm. I'm working on a scene involving a master swordsman (18th century France; he's an old man) and so have swordplay on the brain. It occurs to me that the fact that you know how to swing a sword with precision and elegance doesn't mean that you must use it for every application, including carving the Holiday Bird. It is a question of knowing when to stop. Naturally, that is one of the hardest questions around. Mostly I like to keep things simple, but sometimes I think that exactly the right word needs to be used, and if it happens to have people reaching for the dictionary then so be it. My current WIP mentions "angiomas", which likely many people won't know, but in the context it was simply the cleanest, most elegant way to convey what I wanted to. BTW - don't you love those nursery rhymes rewritten in verbose style? e.g. "Little Jack Horner was seated at a mural intersection masticating pastry..."
I think some of word choice depends on the audience. If you're writing literary, I think you can use a more robust vocabulary than if you're writing genre fiction. And it seems like people can use bigger words in horror and thrillers than maybe cozy mysteries. It's definitely something to keep in mind while editing. Choosing a simple, appropriate word is, at times, quite the difficult task! I think we all have to write what works for us. As a Mom and former teacher, I like it when their reading expands their vocabulary. I'm guessing your style of vocabulary goes a long way toward establishing your voice. Balance is key, I suppose. You don't want to "dumb things down" but you don't want to stop the reader either. I'd make sure you let your first drafts fly with whatever feels right for you. Then, maybe in subsequent drafts, consider whether some words need revising. Word choice IS SO IMPORTANT.... But it also must be clear. In writing I take my READER into consideration before choosing a "strong" word. My first two novels are M/G and Y/A so a writer MUST keep this in mind when choosing the correct word. So it may help you to consider your audience as you write, then the choice may be easier for you. I hunt down words like there's no tomorrow. There meanings don't stay in my head but they sound nice. lol. Consider your audience. I think it's cool when I learn new words from stories I read but there does need to be a balance. I think having beta readers helps. I like the advice that someone earlier wrote on using the proper language for the character. Some people like that extemporaneous talk. It seems to happen when role playing or Ren-fests! I believe it was Mark Twain who said to use the shorter word or phrase, but he was a man of wit, and brevity is the soul of wit! I can agonize over a word/phrase for hours until I find the right fit. But not for the first draft. The first draft I simply power through after thinking, that word isn't right but it's close enough for now. I can lose so much time searching for the 'perfect' word. It's amazing how changing one small word will affect the entire tone, meaning, and flow of a sentence! If the style calls for big words or if a character is prone to using them, it works. Out of nowhere, it won't work. I used to use huge words when I was hooked on my thesaurus. I rarely use it now. I too have a love for words! Word choice is very important. I agree. I think you have to take certain things into consideration, like social milieu, character type/age, audience etc. Okay, first of all, the image of you and your friends playing wordgames is priceless! :) And I definitely agree that it's all about balance. Sometimes a "big" word feels too forced, or it slows down action. Number of syllables can be just as important as the "intellect" of a word, because it has to fit the rhythm of the sentence, the moment. Hi Nick - typical lads! Still you were developing your language skills ... I have no idea where my words come from .. I use them and wonder if they're right .. one today was "convenor" - it seemed to imply what I wanted to say .. so I left it! I adore big words. That is one of the things that attracted me to my boyfriend, his use of unwieldy words. They are often the right words for the occasion, but yeah, depending on your story or character, not so much. I try to have at least one nerdy character in my stories that gets to use those fun words and let the others carry the story. It's all about character, in my opinion. i like to use big words at appropriate times - if the reader doesnt know what it means, they need to look it up and learn something! but seriously, it depends on the character or the pov or the situation - lots of factors go into choosing the right words... if your character is sophisticated, they should use $200 words! not nickel slang! That's tough on where to draw the line. I think if the word popped into your head organically as you were writing, and when you read it out loud it flows, to me that works, even if it's an unusual word. Also, if the surrounding sentences lend context, the meaning of the word can usually be inferred. I also like to be introduced to new words. Though sometimes when I'm reading something it seems as if the author went to a thesaurus to vary word choice and it doesn't quite work. That's where the reading aloud for cadence helps. And lastly, you can't please everyone, right? :) Thanks for visiting my blog! I love choosing bigger and better words other than the ones I usually muster up within the first draft of my story or blog post. Using both the thesaurus and dictionary are second nature to me. Words can be either sacred or tricky; mostly because they can be both beautiful and confusing, depending on the language and plot of your writing. If you go too over the top, readers are less inclined to be interested and more likely to put your book down. But if you find that balance, like you mentioned here, then you can create a masterpiece with the words you wish to illuminate your thoughts with.